The Clumber was developed to support the Dukes and gamekeepers in hunting this and nearby estates that were usually covered in heavy timber and very heavy undergrowth littered with fallen branches and limbs. The white coat ensured it could be seen in most scrub and its build ensured it could penetrate into the depths of that scrub and flush game hiding there or even retrieve shot game. These dogs in peak condition should be 25kg and 46cm tall for the female and 36kg to 50cm tall for the male. This heritage of working in the field is translated into a little independence, particularly when tracking, but they soon check their owner's whereabouts and will look to them for advice if the trail is clouded or lost. Their heritage as a field working dog translates into being happiest in a ‘pack’ or kennel situation with a canine friend for company, and generally a Clumber is preferred, although they adapt well to other non-dominant breeds and so many individuals during the years have been ecstatically happy in single dog families. 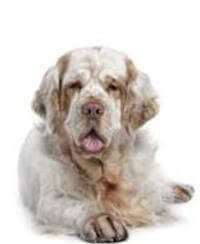 The Clumber Spaniel is one of the most low maintenance of the spaniel family; from about ten months of age they will need their feet trimmed every two months and from about twelve months of age the feathering under the ear hole and from the wrist to the foot on the front legs and from the hock to foot on the hind legs will also need to be trimmed every two months.